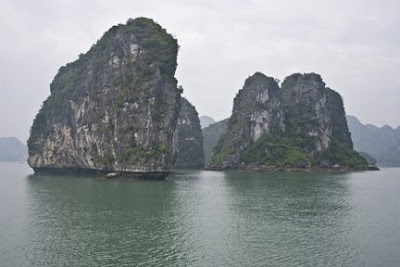 Halong Bay on the Gulf of Tonkin, as with other popular destinations, isn't without the attendant scams and traps awaiting travelers. Getting the most out of any trip is a matter of arriving with an open mind. Expect to haggle and stay flexible; you'd be surprised how far patience and good humour goes. 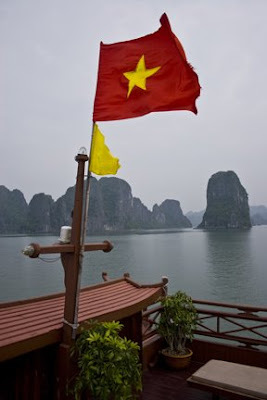 I normally avoid package tours but it's unavoidable here, unless you have the luxury of time and nettle to dicker your way onto a private boat with the locals (it's legally not allowed). 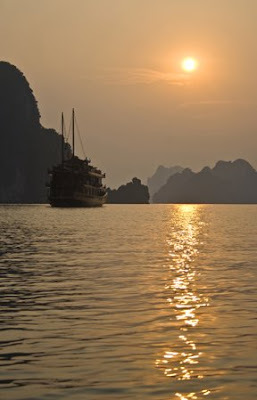 As of May 2007: 2day-1night boat trips ranged the gamut of $30 for a small junk to $180+ for an Emeraude cruise. Know your traveling style and philosophy, as there are benefits to all options. 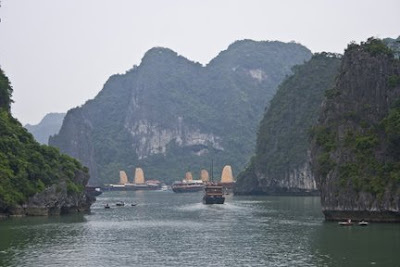 For example, the bare-bones trips offer a glimpse into local life that luxury cruises do a very good job of sheltering patrons from. 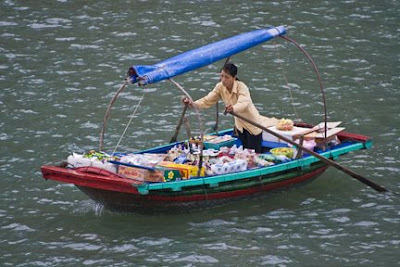 Being no-frills, guests are allowed to haggle with vendors who float by, towing anything from Oreos to locally-caught seafood from boat to boat. They even have the equipment necessary to make a very tasty local meal for you. Guests can ask for an informal cooking lesson in the galley, request a special itinerary or stops not advertised by the booking agent. This interaction with locals and flexibility is limited with the higher-end cruises. Because they have more offerings, guests are charged for bringing purchases on-board, and the advertised schedule is strictly adhered to. But they also offer more comfort, have better amenities and an array of entertainment options. It's really quite up to the traveler's comfort needs. It was the start of the rainy season in May, but the downpours were predictable and short. 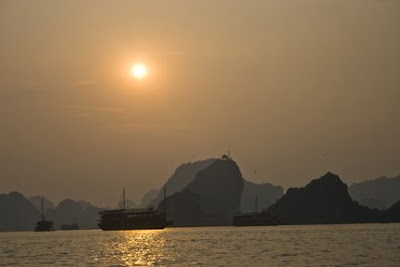 That said, words can't capture the beauty of Halong Bay. 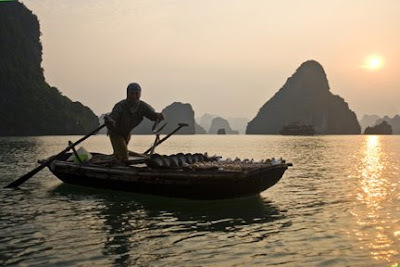 Interesting activities at dawn.... dynamite fishing. It's illegal, as it doesn't just kill fish. The sudden underwater shock indiscriminately pulverises the underlying habitat and destroys the surrounding ecosystem. 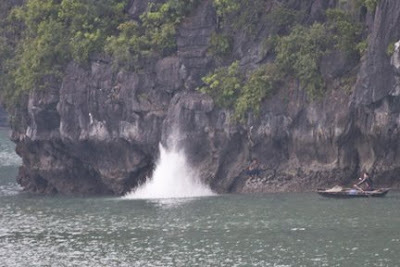 Typical of a longer itinerary is a stay overnight at Cat Ba Island. 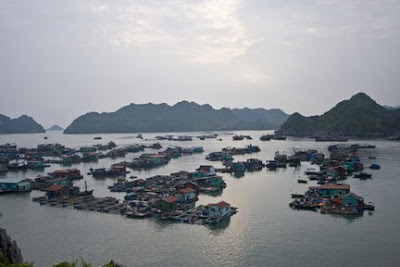 No white sand and surf here, and no entertainment-- there's a floating village, some swimming and short hikes. Getting invited to a meal is great and isn't hard to do, as locals are all very friendly and eager to meet visitors--as well as earn some extra cash! 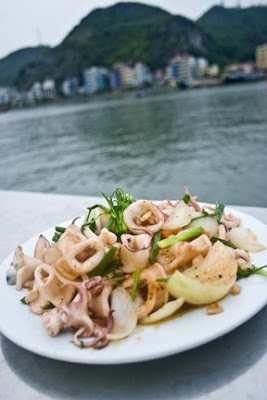 Otherwise hit up one of the floating restaurants for a seafood treat that isn't so hard on the wallet. 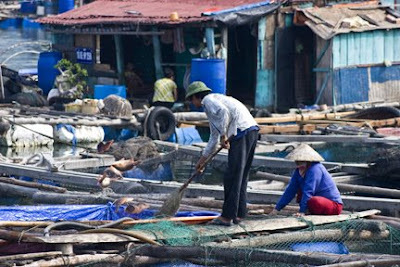 Birders might find this is a good stop as the fish farms and constant churning of the water from the junks offer easy meals. 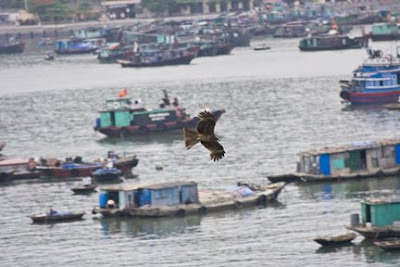 There were a dozen black kites and red-whiskered bulbuls, some of them in aerial combat over territory. It's always interesting to watch fierce smaller birds chase off birds of prey ten or more times larger than they are. 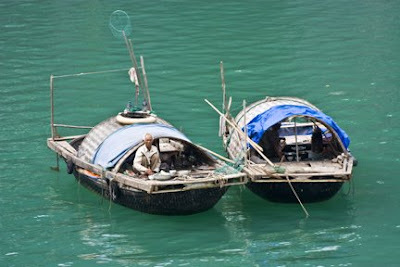 These amazing boats look like they're barely skimming the top of the water, they're so buoyant. 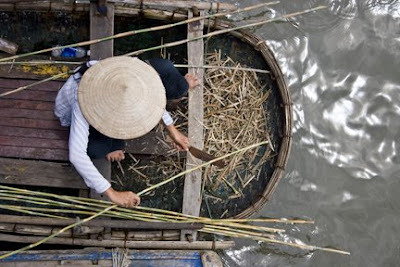 This woman is cutting some bamboo to strips to repair another boat. Doesn't it look like the boats are floating just right on the surface of the water? 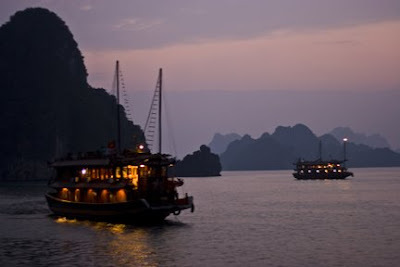 To see more Halong Bay photos see Keith Kelly's Flickr page.